I'm gearing up to get the Tackle Your TBR Read-a-thon going again this year (here are the schedules from 2016, 2015, 2014 and 2013 in case you want to take a look). 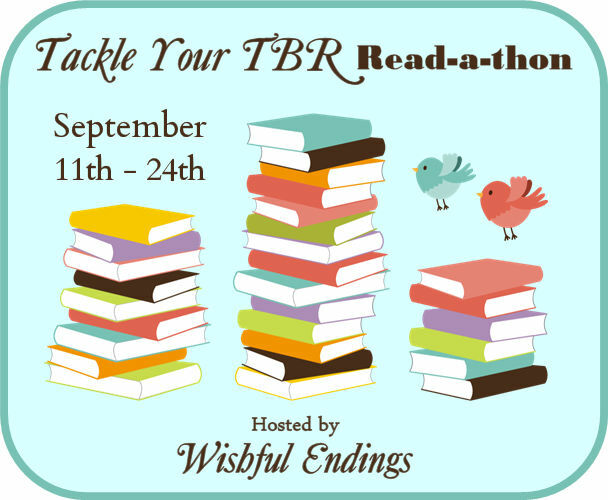 The Tackle Your TBR Read-a-thon is hosted here at Wishful Endings. It runs from September 11th through 24th with the goal of diminishing our to-read pile of books. All books in any format and source count and you do not have to be a blogger to participate. There are challenges and giveaways as well. You can sign up through September 23rd. Find out more and sign up below. The Tackle Your TBR Read-a-thon begins Monday, September 11th and ends Sunday, September 24th, with a wrap-up (including giveaway winners) on September 25th. You do not have to be a blogger to sign up. Just use your Goodreads, Twitter, Facebook, Pinterest, Instagram, or Tumblr, or leave a comment stating that you'll just post updates on my blog commenting on my updates instead (basically just pick a place you're going to post updates on and let us know where to find them). For the linky, you need to leave a link (your blog, Facebook, Twitter, Instagram, Tumblr, etc.). If you don't have an actual site you'll be using, like if you're going to participate by leaving comments on my blog, then just state "in comments," or if you're going to only use the Goodreads group then state "Goodreads group," but leave your email so that I have a way to reach you. When the read-a-thon officially begins, you all will have a chance to add a sign-up/goals post (or leave it in comments in response to mine). Please sign up using the linky at the end of the this post (even if you're only going to be participating via commenting). You MUST be signed up in the linky to enter any related giveaways and participate in the challenges. YOU ARE REQUIRED TO POST A SIGN-UP POST (with or without goals, we will be posting goals too, but that isn't required) AND A WRAP-UP POST (at the end of the read-a-thon) TO BE ELIGIBLE FOR THE GIVEAWAYS HOSTED HERE. The wrap-up post can just be your initial post with a final update added. It does not need to be a separate post. Sign up using the linky below and add the read-a-thon to your calendar! I'd also love it if you would spread the word by posting the read-a-thon button on your sidebar with a link back to this post and/or sharing on social media (remember to use #TackleTBR). Feel free to comment or email with questions. Then on September 11th come back here to join us in reading! Looking forward to reading with you all again this year!